In the wake of successes by other commodity 'brand' groups such as aXXo and YIFY, popular release group ShAaNiG carved out an enthusiastic following among public BitTorrent and file-host users. But after thousands of releases the ride is now over, with the group's website and operations closed down for good. While there are dozens of torrent release groups in operation today, some providing extremely high quality work, every few years a notable ‘brand’ group appears. Two of the most famous from recent memory were aXXo and YIFY. Neither were known for historic individual releases or world-beating quality, but both were particularly consistent. An aXXo or YIFY label on an official torrent assured the potential downloader they would be getting a ‘McDonalds-quality’ product; never haute cuisine but just enough taste and in enough volume to fill people up. As a result, these groups gained millions of followers, something that put anti-piracy targets on their backs. No surprise then that neither are around today, with YIFY subjected to legal action in New Zealand and aXXo….well, no one seems to know. With those groups gone, there was a gap in the market for a similar product. Popular releases delivered to the masses in small file sizes is clearly a recipe for success and an existing group called ShAaNiG decided to step in to take up some of the slack. What followed was thousands of ShAaNiG movie and TV show releases, which were uploaded to The Pirate Bay and direct download sites. They also took pride of place on the group’s forum at Shaanig.org, where they were neatly organized into relevant categories. But like aXXO and YIFY before it, something went wrong at ShAaNiG. After publishing a couple of releases on Saturday, including a Blu-ray rip of the movie Jawbone and an episode of TV show Outcast, ShAaNiG unexpectedly threw in the towel. A notice on the group’s homepage gives no reason for the sudden shutdown but makes it clear that ShAaNiG won’t be coming back. While there are only so many ways to say that a site has been shut down for good, the first sentence is identical to the one used by ExtraTorrent when it closed down last month. 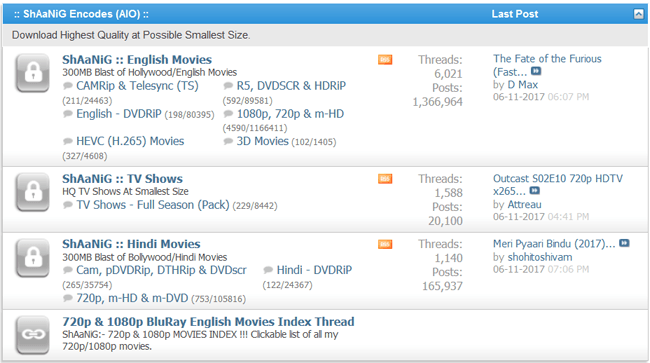 Another potentially interesting similarity is that both ExtraTorrent and ShAaNiG had huge followings in India, with both sites indexing a lot of local content, especially movies. More than 30% of ShAaNiG’s traffic came from India, with much of it driven from The Pirate Bay where more than a thousand releases live on today. When ExtraTorrent shut down, around 40% of the new traffic arriving at another popular platform came from India. Whether the Indian connection is pure coincidence remains to be seen, but it seems possible if not likely that some kind of legal pressure played a part in the demise of both. However, if the situation plays out in the same manner, we’ll hear no more and like ExtraTorrent, ShAaNiG will simply fade away. While that will come as a huge disappointment to ShAaNiG fans, other file-sharers are likely to have less sympathy. Like aXXo and YIFY before it, ShAaNiG was rarely (if ever) the source of the material it released, instead preferring to re-encode existing releases. For some pirates, that’s a red line that should never be crossed. Whether a new group will rise phoenix-like from the ashes will remain to be seen but as these ‘brand’ groups have established time and again, there’s always a market for passable quality movie releases, if they come in a compact file-size. Are Torrent Sites Using DMCA Notices to Quash Their Competition?